Join fellow agility enthusiasts as you progress your team's handling and obstacle skills in our supportive, fun, and challenging workshops! We offer a range of workshops from Agility Trial Prep Mini two hour sessions to half day intensive skill building groups. Working with instructor Katrin Andberg Hawkins, CBCC-KA, CDBC, you'll gain insight into your agility teamwork through the lens of a certified behavior professional and agility nationals winner. 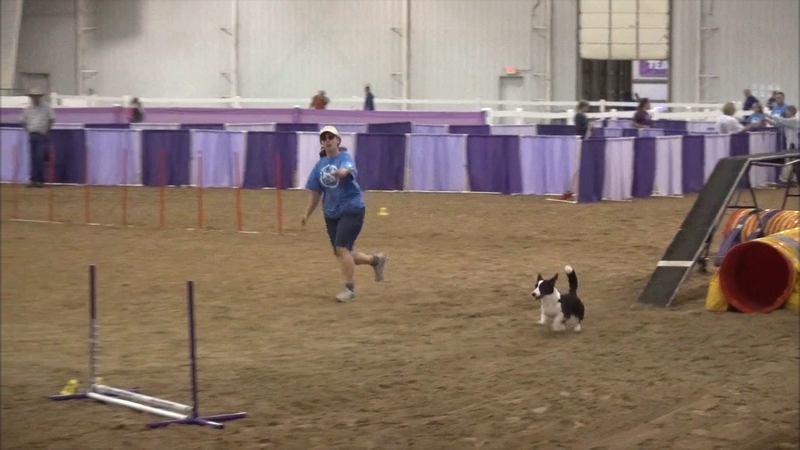 With emphasis on helping agility teams build solid foundations for high level performance, you'll gain feedback for increasing clarity, communication, focus and reliability in your relationship with your agility dog in and out of the ring. Workshops are suitable for teams working at an off-leash level in a group class type setting. Dogs should be comfortable being quietly crated when waiting their turn. Most workshops assume, at minimum, prior introduction to agility through instruction at Maplewood Dog or elsewhere. Read workshop descriptions for details on expected skills for that event. Exercises can be adjusted for puppies and growing dogs. Questions about workshop suitability for your team? Contact us and ask, we're here to help! All workshops are held outdoors on grass and are weather dependent, unless otherwise noted. Agility equipment is NADAC specification including black rubber slat-less contact obstacles. Additional Workshops may be scheduled at participant request. Practice your competition ring ready skills for the trial weekend! Each Trial Prep Mini workshop will offer opportunities to gain feedback and practice on various sequences from actual competition courses. Struggling with your cross cues, path and timing? Increase your proficiency with rear crosses and lead change cues at a distance, and distance obstacle commitment to give you the freedom to move more efficiently for executing front and blind crosses. For many dogs, their ability to weave or hit the contact zone is dependent on where the handler is and what the handler is doing. When it comes to Chances, Gamblers, and other distance classes, this can really impact Q rate. In this workshop, we'll cover how to train independent obstacle performance from the beginning as well as figure out your dog's current understanding of contacts and weaves then work to increase your dog's understanding of independent obstacle performance. Workshop is suitable for dogs learning weaves and contacts as well as experienced teams. Does seeing a tunnel next to a dog walk on course make you quake? Improve your discrimination skills and confidence with exercises to help handlers and dogs understand cue timing, clarity of signals, footwork, path and how to recognize discriminations on course, all while gradually increasing your ability to consistently cue your dog to the out vs in obstacles from a distance. Work your team's jumping skills at a distance. Practice handling your dog to the most efficient jumpers course path without having to be right there. Exercises to build jump commitment, handling clarity, sends, crosses and distance skills. Prerequisites: Able to sequence 4-8 obstacles, and dog is proficient with jumps and tunnels. Young dogs accepted with bars on ground or low jumps. Dogs prefer to move in curved lines, yet in agility we often ask them to run in straight lines. In this workshop, we'll be building value for a Go! run in a straight line cue away from you and parallel to you. We will be working on confidence with sending, driving off of start lines, and committing to the Go handling line.